Frankly, it feels too soon for me to know exactly what I've gotten out of this Quixotic quest of mine. Perhaps in a few months I’ll be able to see it, but right now I’m just relieved to be done. For, while I definitely believe in the invigorating power of trying something new, I would never recommend committing to it daily. I find it ironic that I began this project because I was in a rut and the sheer routine has become a rut unto itself. Likewise, I don't have enough distance from the mid-life crisis that inspired the whole thing in the first place. I think Dante put it best when he wrote, “Midway on our life's journey, I found myself in a dark woods, the right road lost. To tell about those woods is hard - so tangled and rough..." Like Dante, I’ve descended in order to ascend, but I still feel like I’m on an uphill climb. Part of the problem is that this project was born in part out of the recession. Long before Wall Street reacted to the subprime mortgage crisis, I watched my savings disappear into a sinkhole of a real estate investment. The financial conditions that constrained me in the first place are worse than before, so I still don't have the financial freedom I'd like. (I know, who does?) I’m still lucky enough to make my living as a writer, but it’s not enough to live it up. As a result, I’ve strived for cheap thrills, managing to spend roughly $725 total on this project, an average of $2 a day. But that, too, was part of the point—to prove I could find adventure within limited means. Anyone can splurge on an expensive trip or toy or react to a midlife crisis with a scorched earth approach to your life. But my goal has been to change my life without exchanging it. I'm happy to report that trying something new each day has provided temporary relief to my ennui, enough so that I’ve decided to continue on this journey by committing to one new thing a week, which I will post each Friday. Then, on Wednesday, I'll post a link to my and Floyd's new blog adventure for 2009: The Mesmer Project. 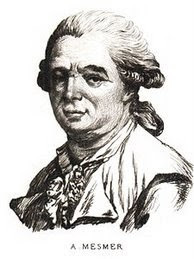 The German physician Franz Anton Mesmer introduced "mesmerism" in 1774. His ideas and practices led to the development of hypnosis. One who mesmerizes is one who keeps us spellbound with their stories and ideas. These people captivate our imaginations and propel us in new directions. Therefore, this Wednesday we'll ask the first of the five most fascinating people we know five questions in order to understand what makes them tick. Subsequently, we'll also ask each of those people who is the most fascinating person they know. Which will lead us on a journey to find the most fascinating people in the world--who speak English. Much in the way I sought adventure here at home when I couldn't go finding it elsewhere, we've decided to bring the most fascinating people to us. And to you. "IF YOU CAN'T GET OUT OF IT, GET INTO IT." We wish a hearty, healthy, and happy New Year to you and Floyd! Glad you completed your full year and have had it linked on my blogspot for most of the time. My husband and I are in Escondido, California. We flew out one day before the Portland, OR snowstorm to Ontario, CA, then drove to Palm Desert for one week at their Intrawest Resort. Then on to Lawrence Welk's Desert Oasis in Cathedral City for a week. Now we're here in a more verdant landscape (also Lawrence Welk), and back home on January 3, 2009. I assume you've seen "Milk" with Sean Penn. I gave the movie an "A" and was totally blown away by all of the performances. I think your new year plans are mesmerizing. I know - the cheap pun. But truly, joining you on your 2008 new-thing-a-day year, albeit vicariously through your blog, has been a blast. It has made me pay attention to the new things that occur in my own life (though I could have done without the refrigerator dying a week before Christmas, and the patio roof collapsing from snow). Thank you for sharing your adventures, your thoughts and your humor with all of us who visit you through this site. The mid-life crisis is a journey of transformation that begins with the desire for a new awareness. Don't worry, you'll get there. It's a process and your plans for 2009 are awesome, made even more so because of the partnership aspect of you and Floyd sharing the journey. Love your first Thought for the Week! thanks very much for a much more amusing year, thanks to knowing every day there would be a new post from you. As Errol Flyn said, it´s been a pleasure walking through life (in this case, a year) with you. Im relieved there´s going to be more proyects. I love the fact that you've taken an ennui (as you put it) and turned it into a publicity forum. Prior to 2008 I never would have known about let alone go out and buy "How I Paid for College". Now I follow you on NPR and the like. Congratulations to a well thought out plan. I look forward to reading more in '09. Happy New Year and let it be happy, healthy and prosperous! Congratulations on a year well lived, and I am SO looking forward to The Continuing Adventures! I have been a follower of this blog long before I even got to read your books (sorry, I waited for my friends to give them to me this Christmas which they have!). I'm so looking forward to reading your books and know that I'll remain addicted to your posts as we venture into the new year. P.S. I just became your fan on facebook! Yay! And is Holidazed coming to New York soon? I'd be lying if I said I wasn't a tiny bit crestfallen at the closing of this daily project. Mainly because it offered me many an opportunity for shameless "celebrity by association" publicity. Not to mention the fact that I am the proud recipient of a lovely and immortalizing moniker, (I'm quite sure someone, somewhere will always think of me as "Young Noah"). But lapsing for a moment from my typical narcissism, I do have to say that I'm so honored to have become a part of your New Things Journey as well as your life in general. I love you dearly and feel incredibly blessed to have you as a mentor, a friend, and a fairy godmother. I want to thank you once again for sharing your New Thing Blog. I have enjoyed reading it throughout the year. It has been a touchpoint from which to examine my own life and encouragement to try as many new things as possible. I look forward to your postings in the New Year as well as your new novel. I'm wishing you much good fortune in 2009! My mission: to create entertaining theater that illuminates the human spirit.